It must have been a combination of natural born character and lessons learned from having to make do on an Island separated from “ The Real World” during hard times in the 1920s and 1930s that enabled Albert K. Ottison to survive by making everything he needed from brooms to boats. Whichever the case Albert never waivered from the painstaking hard work and the constant search of a challenge in his creations that kept him active until the end of his life. Albert was a carpenter for Mike Lamb at the White Elephant and for several other Islander builders during his life. He spent time building boats from wood salvaged from the landfill and with nails that he made himself. He is known for his dove tail sea chests with intricate hand woven beckets (handles). There was such detail in the beckets that it took a week to complete just one pair. Albert stated at one point during an interview that weaving baskets was a good way to pass the time. As a child he hung around Mitchy Ray’s Shop, and later became a self taught basket maker. Although not a prolific commercial weaver, his baskets proved to be a fine example of his craftsmanship and a testament to the endurance of his work from the mid 1930s into the 21st century. Albert made every component used in his baskets, (except cane) and preferred to use oak for wood. He also used a five gallon can attached to a gas burner to “cook” the rims for ten minutes in order to bend. Albert sold a few baskets through Bill Coffin’s variety store in the mid 1930s, but times were tough and the baskets did not sell too well. He later opened his own shop where he sold his wooden carving on his property. 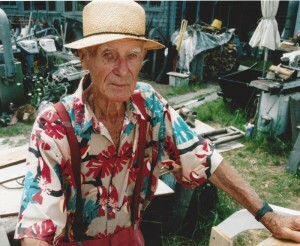 Albert and his wife of 67 years, Helen, raised two sons, Albert (Buster) and Karl on their property on lower Orange Street near the creeks overlooking Monomoy Harbor. The boys were taught the value of re-use and salvage through the life style of their dad. Whether they hauled trees that blew down in storms for a later use, built their houses out of ship wrecks, or fashioned an old car to power the saw mill, the life lessons learned from Albert Ottison will endure. Albert Ottison, master craftsman, boat builder, quintessential recycler and local hero to many, will be with us in his work and his art and his good old fashioned ingenuity.